"One thing that can�t be denied is the town�s beauty. It�s surrounded by lush jungle and rice paddies, and there are ceremonies almost every day. The name itself means medicine and as such Ubud has become a magnet for not only Balinese healers, but also Western alterative health practitioners of every kind � something that was only exacerbated by the book and film, Eat, Pray, Love. 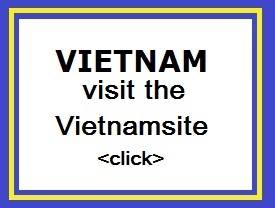 Steve and I lived there for five months and learned to love the town behind the tourist fa�ade. I also threw myself into the health scene with mixed results." 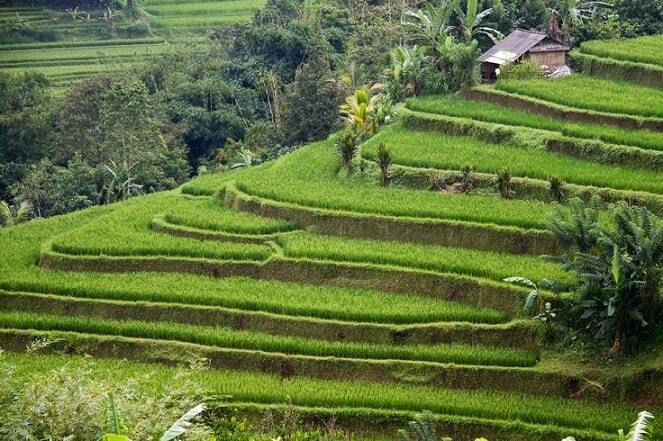 Bali rice is grown in terraced fields, which grow step by step. Incidentally Bali consists mainly of rice fields and plantations. The mild climate, the local mountain lakes and the fertility of the soil make the island ideal for rice production. 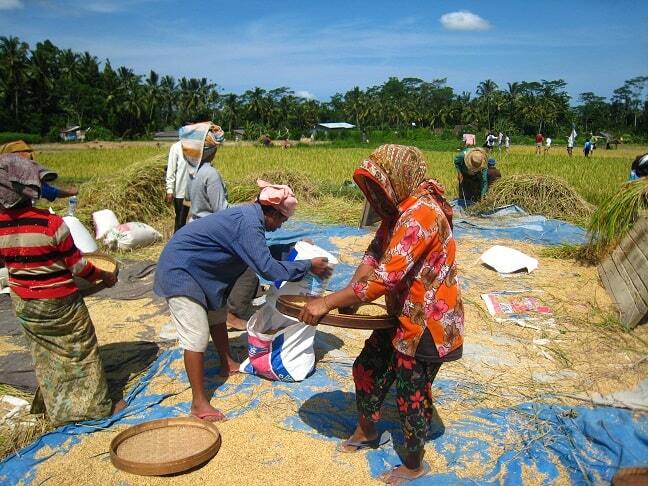 The cultivation of rice in Bali is traditionally small, with lots of fields for their own use. Rice is in these regions is an important food source. Some build on a sawa "a baleh", a resting place for the labourers with a roof of straw or corrugated iron. On the sawas of larger plants can you see also berths, but they are built for labourers, who come from Java to work here. These are residential cabins. On mountain slopes have a terraced rice fields, fields surrounded by earthen dikes, which bend with the shape of the mountain. Sometimes these emerald green terraces go from the top to bottom, as if you were sitting in an old theatre. The the rice fields must have been ploughed by a team of buffaloes. If the rice fields have been ploughed they press a foot hole in the ground to make the rice seed drop. All this is done in a small corner of the paddy fields. Out of the rice seeds grow small blades: the "bibit". later the young blades (bibit) should be changed to the ploughed rice fields. This is women's work. They stand hours for hours bent over in the sawa. Now the plants grow in long rows in the mud. The local islanders of Bali provide the fields with water for centuries by the way. The structure of the landscape here is important. 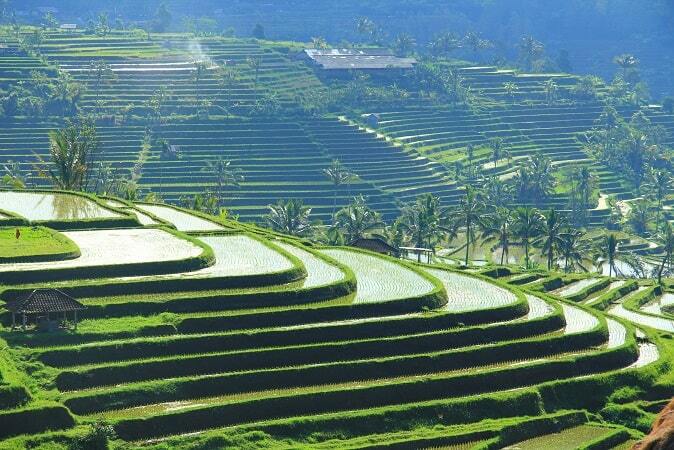 Rice fields in Bali are built in terraces, so there are different levels to occur. The level differences provide excellent irrigation, because the water flows from one field to the other. This pretty ingenious system of waterways, keep the rice fields wet. This type of irrigation is managed by a subak, a water association of farmers. They also decide where temples are placed and carried out rituals to Dewi Sri, the goddess of rice, to beg off a prosperous harvest. Sometimes you see the goddess standing in a field, made of bamboo and palm leafs, devout and charming. During the growth, the water level is increased. Therefore the rice can grow well and ripen further to beautiful, green rice fields. When the plants are fully grown they let the water out from the rice fields. You will see small streams flow to the lower rice fields. Now the stalks are yellow and can be harvested. The rice is ready after 3 months. In the old days the harvest was done by women with a knife, which they had in their hand. This knife is called the "ani-ani". Today, the harvesting is done mechanically. When the rice is harvested they call it "paddy". On Bali nowadays it takes three harvests per year when they use fertilizer. Now the rice grain has yet to be taken out now. In the past it was done by stamping the the rice grain in a large bin of stone. This was done by two women with in a hand a pestle, which was larger than the female herself. A terribly tiring job, because they always had to switch the pestle to the other hand. After some time the rice is from the stalk. The remainder of the blade is called "gabah". The rice cover is called "beras". The "beras" now has to be stripped of the silver film and then packaged. When the "beras" is cooked, it is called nasi. In flatter areas have sawas more square. If they are not planted, they are like mirrors in the country. mornings shrouded in mystery, with here and there a palm tree that his green fingers sticking up like a beacon. In the evening they turn the landscape into an unlikely glow in the reflection of sunset. The most beautiful rice fields can be found in the following regions: Tirta Gangga (in the extreme east), around Jatiluwih (and along the slopes of Mount Bratan), just north of Ubud and around Sidemen and Selat (southeast near Candidasa).